The Webster University community extends condolences to the family, friends and colleagues of Thomas A. Janke, longtime faculty member, faculty coordinator and campus director in Texas and Florida. Janke's career at Webster University began in San Antonio, where from 1976-1984 he served as adjunct faculty member, graduate faculty coordinator, and the unofficial faculty pilot, flying the group from San Antonio to a cohort site in Del Rio every weekend. He returned to Webster University in 1997 as the faculty coordinator for the Ocala, Florida, campus. Shortly thereafter he was promoted to director of the campus. 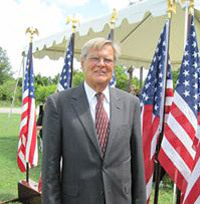 In 1998, Janke was asked to move to Orlando as the regional director of Central Florida, where he served until his retirement in June 2013. A passionate teacher with a PhD and a JD, at Webster Janke was active in the classroom, often teaching the MBA capstone and ethics courses. Working with his teams across the state, he served as an advocate for students and faculty in Florida to assure quality experiences in the classroom. He passed away Nov. 3, and a memorial service was held at Webster Orlando Nov. 14. Colleagues and friends also remember Janke as a polo player, a Mensan, a musician, a boxer, a motorcycle cop, a nuclear reactor inspector, a Vietnam veteran and colonel, a pilot, a paratrooper, a rancher who bred miniature horses, an attorney who arbitrated cases for the Better Business Bureau, and more. Per his wishes, Janke's family has established a scholarship fund in his name at his alma mater, Watertown High School in Watertown, Wisconsin, for students interested in pursuing an educational career.